I’ve been thinking about romance in general and in Nita’s book in particular. 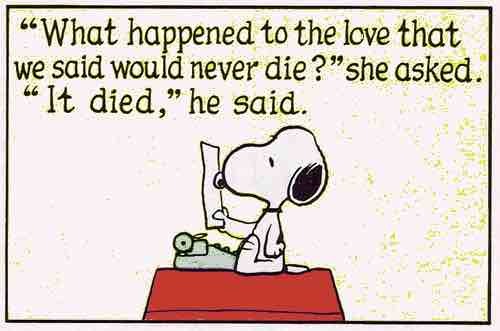 Romance is tricky stuff to write even if both of your lovers are alive, so making one of mine dead complicates things. But two things in the past month have made me look at it again. One was a comment Elisabeth made, and the other came from watching Galavant again, this time with Krissie. I’d made a comment in one of the WiP posts about Nick not having emotions because he’s dead, but that wasn’t quite right. He’s not emotionless because he’s dead, he’s emotionless because he doesn’t have a body. He creates the illusion of a body, but there’s no mass there, no blood, no nerve endings, just a skeleton and a lot of illusion. And that means he can’t feel anything, not just hot and cold and pain and lust, he can’t feel emotions because emotions live in the body. We don’t have emotions apart from our physical beings; they’re called feelings because our bodies feel them. I knew this from studying with Ron Carlson, the originator of “Emotion lives in the body,” but it wasn’t until I wrote a guy who didn’t have a body that I really grasped what that meant. I mean, think about the last time you were in the grip of strong emotion. Saying, “I was shocked” or “I was sad” doesn’t tell anybody anything. But saying, “I couldn’t catch my breath” or “I cried, those big hacking sobs, ugly crying” tells your listener just how surprised or grief-stricken you were. Which means if you don’t have breath to lose or tears to cry, you can’t feel anything. You can make judgements in the abstract–“”That was a bad thing that just happened, I wish that hadn’t happened”–but you can’t feel bad. You can’t feel anything. You’re dead. And that’s why I said Nick doesn’t feel emotions; he doesn’t feel anything. He’s dead. So when Elizabeth wrote: “One way in which your current Nick and Nita intrigue me is that they’re connected more by plot than by character, unless the point of your post today is that character ties will develop. I think you implied that this is not a romance because Nick doesn’t have emotions because he’s dead,” I thought, I didn’t explain that right, that’s not quite it. Because Nita’s book is still a romance, it just starts with two people who are disconnected from their emotions. They’re good people, they’re just cold and unfeeling. They’ll do the right thing because it’s the right thing to do in the abstract, they’re guided by morals and values, not by feelings. Nita isn’t quite as cold as Nick–she still has a pulse–but she’s shoved her feelings away since she was a toddler so she has no idea how to access them now. This is the point in a book where I look at what I’ve set up and think, Why the hell did I do that? I’ve learned my lesson about depressed heroines (never again), so instead now I’m doing not-quite-dead-yet heroines? And dead heroes? And yet, my instinct says that’s where to go, so that’s where I’m going. It was right about that time that Krissie came to visit and we watched all of Galavant over two nights. Galavant is lousy with romance: King Richard sees Madelena and carries her off because he’s fallen in love; Galavant agrees to help Isabella so he can get Madelena (his one true love) back; Galavant and Isabella fall in love; and Chef and Gwen take a chance on romance even though they’re serfs. All of that’s before we get to the second season and two more love stories, one featuring the beautiful ballad, “Maybe You Won’t Die Alone,” and the immortal words “Put. Down. That. Cat.” Plus Uncle Keith and Destiny, and Richard and Tad Cooper. It’s like Love, Actually with hangings and armor. 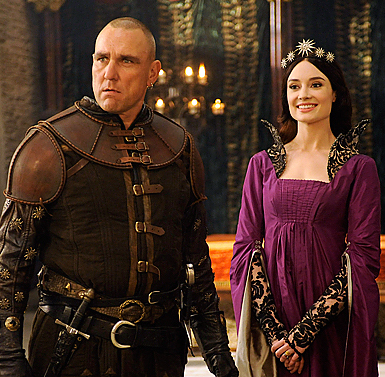 But my favorite romance in Galavant was one I did not see coming. SPOILERS FOR THE SECOND SEASON AHEAD. Richard survives her betrayal only because his bodyguard breaks him and Galavant out of prison and tells Galavant to take Richard back to his own kingdom (they’d invaded the one they’re in) so he’ll be safe. His bodyguard, a thug named Gareth, has been watching over Richard since they were both ten, acting out of duty and a sense of mission, pretty much killing anybody who gets in Richard’s way. Not a big guy for feelings, although he has a moment at the end as Galavant sails away with Richard. I said this is would be a spoiler, but I can’t ruin the magnificence of the moment when Madalena becomes a (semi)human being, except to say it involves an event so traumatic that it almost breaks her heart, and Gavin realizes it and brings her a gift to make her feel better (best gift ever), and she’s so touched, she kisses him on the cheek, and it’s one of the top five Best Romantic Moments Ever. Of course, they’re hopeless at expressing feelings, so Gareth finally resorts to yelling “I love you” to the troops when he and Madalena are reviewing them before a battle, and she panics, but then she finally smiles and blushes, and they’re just so darn cute. Sociopaths, of course, but so much in love. And at the end when she’s leaving, and she looks back at him and says, “Thanks for the love,” trying to be cool about it but still loving him so much . . .
Where was I? Right. Vulnerability. Everybody has feelings, but it’s the characters who don’t know how to deal with those feelings that kneecap us. (Think Shaw on Person of Interest standing by Root’s grave, not knowing what to do.) If you combine that with the “Oh, hell, not you” moment, another vulnerability kneecap, you’ve created a powerful dynamic for a great romance. And that’s what I stumbled into with Nita and Nick. Of course, I still have to WRITE it, but hey, the dynamic is there, so points to me. And now back to typing . . .
< Previous Eight Ladies Hosting One Fine Writer . . . This is brilliant and explains, perhaps, why my writing partner keeps throwing explosions and terrorist attacks and gang beatings into our WIP. Vulnerability! I think she’s doing it subconsciously, though, since she can never offer either Watsonian or Doylist explanations when I ask her why the cast blew up/who sent the terrorist kidnappers/why did the gang descend upon Our Hero. The Girls in her basement are just vicious! I see what your saying about feelings and the body. That is certainly where we experience them the strongest but I can’t agree that without a body we don’t have them. City of Angels is a good example. Nicholas Cage’s character has intense feelings. It’s why he chooses to become human. But he can’t feel as an Angel. Literally can’t feel. It’s not quite the same thing. (In maybe this time the ghost slowly lose there humanity until there is nothing left but the strongest feeling they had). Maybe some more clarification? ? I think there’s a difference among emotions, feelings, and drives. She quibbled. Emotions are abstracts to a certain extent–love, hate, fear, outrage, they’re all states of being. But I think as humans (and readers and viewers), we don’t process abstracts well. The difference between what we know and what we feel can be huge. So while we can know that a character is sad (his mother just died!) it’s still an abstract until we see him process his grief physically–he snaps at people, he moves more slowly, he puts his head down on his desk, etc. “He’s sad” doesn’t communicate to us a feeling because “He’s sad” doesn’t show what he’s actually, physically feeling, it’s just his state of being. Put another way, it’s a static description instead of an active demonstration of grief. And then there are the things that drive us, which is what May and the other ghosts had in Maybe This Time (and which I did not connect to this until now). May and the ghosts don’t have bodies, so they’re left with the driving need that was part of them when they died. Miss J wanted her baby and got Alice; she doesn’t love Alice, she doesn’t even KNOW Alice, she’s just a drive to mother and Alice was born into her sphere. Quint wants the house so everything he does is to act as the master by trying to take Carter and North, the real owners of the house. Those things aren’t emotions, they’re just the remnants of who those people were. May lasts longers because she’s newly dead and she remembers, but she also possesses people, stealing their bodies to get sense memory back. If the ghosts in MTT had real emotions, Miss J wouldn’t have haunted Alice because it was bad for the little girl, Quint wouldn’t have tried to take Carter because he’d have realized that making Carter an ally would get him closer to what he wanted, and May wouldn’t have done what she did in the end to Andie and the kids. Aside from Quint, these weren’t bad people, but those drives stripped of real emotion, real love, become obsessions without meaning. Which makes me think of Nick. He died a successful administrator, trying to organize and protect his uncle’s shadow organization, so ending up in hell and getting drafted to work for Satan to organize and protect the Afterworld makes sense. But he’s also not human any more, he’s dead, so he’s lost his emotional component; he’s basically a spiritual computer, which is why the others have such a hard time connecting to him. Demons are much like humans in their desires and emotions, and it’s hard connecting to somebody who never laughs, never gets angry, never sheds a tear. As Nita thinks in the rewrite, there’s no there there. Nita has emotions but they’re so buried that she’s not quite human, as Nick still thinks in the rewrite. There’s a wrongness about both of them that I just wrote into the story without knowing why, and this gives me insight into why. Nick shatters Nita’s world and she’s forced back into humanity by the enormity of it all, swamped by anger, and then outrage, and then lust, and then love, a 180 change. Nick . . . I’m still working that one out, but it has something to do with the relationship of emotion to physicality. There’s one point where he tries to underestand why Daglas would give up everything for Daphne, and I think trying to remember emotion would change the way he presents himself, the more he reconnects with visceral memories, the more his facade becomes more real, but that wouldn’t make him Not Dead. I think he’s going to stay dead, but he’ll have to get his physicality back somehow, so that’ll take some more cogitation. I’ve never seen City of Angels, so you’re on your own there. Poignant movie. Well acted. Worth watching. Here is a thought on Madalena and Gareth SPOILER. I get what you mean about their two moments of vulnerability (as two people “who aren’t good with emotions”). I think you’ve set yourself up with a difficult project if you are translating those characters’ romance into a novel’s worth. How long will your reader hang on if the two protagonists are “cold and unfeeling”? Do Nick and Nita, like Gareth and Madalena, have to wait until the psychological climax of the story to become vulnerable and have feelings? No, their arcs have to start in their first scenes. If you look at Maddie and Gareth, they’re mainly minions and complications until Season Two; Season One is about Galavant and Isabella with Richard as a bumbling antagonist. Season Two opens with Maddie and Gareth on the throne, planning to take over the rest of the kingdoms, to that when they move from subplot characters to antagonists and start to grow, and they do that almost immediately with Gareth demanding a role in her life (king!). Galavant is very short, the entire two seasons are less than nine hours total. The episodes are half-an-hour-minus-commercials, and there are eight in the first season and ten in the second. One weekend should do it. You’ll thank me. Watch Galavant when you need to laugh. It is excellent! I am just a reader, but I disagree about feelings. I think feelings are all in the brain. The brain tells you how you feel, happy, sad, takes my breath away. None of that can happen without the brain’s permission. Just my 2 cents. Yes, but the brain doesn’t feel aside from brain injuries. Emotions are all in the brain. Feelings are in the body. To be honest, I’m not super into this whole devil/Lucifer plotline so far…but it strikes me that if you’re writing a hero with no feelings and he’s dead and a heroine who’s barely more alive and has barely more feelings…the point of doing a story like that is to awaken said feelings. As the old Evanescence song went, bring them to life. People like stories about people who have been in emotional comas for years and then get woken up (I’m thinking about Phin living out his life to read books and play pool and raise his kid and sit through boring council meetings and that’s all he’s got going until….) because of the other person coming into their life. Now that said, I don’t know how you can pull that off if your concept of Nick is that he’s dead, has no real body, and thus literally cannot have any real feelings. Unless you somehow re-embody him, I guess? Anyway, if that’s your concept of him as a spiritual computer who can’t love, then that seems like an issue that would ruin a so-called romance. That is the problem. I know how it happens on the page, I’m just not sure why it happens yet. That’s okay, it’ll come to me. This discussion on Nick makes me think of Dennis in MTT. Intellectually he is aware and he does have some feelings (He really feels strongly about investigating the afterlife although not enough to go along with Isolde ) but bottomline is that he does not really care about how what he wants affects anyone else. He doesn’t particularly want to cause trouble but he doesn’t care if what he wants makes things difficult for everyone else (I think May is further along in her indifference to others emotional well-being then Dennis but she has been dead longer). I think Dennis may have been somewhere on the spectrum before he was dead, so there wasn’t that much of a change afterward. Perhaps Nick needs a body? Maybe someone who is brain-dead? In a coma somewhere in a hospital. Someone who looks entirely different from Nick’s illusionary body. If Nick gets into this new body, would their love survive? I wouldn’t think so since he’d be a body snatcher and Nita’s a cop. She’d probably arrest him. Feelings. They’re more than just activity to illustrate the dialogue–they’re what’s really going on here. I’m going to quibble just a little bit. If a being has a presence in the physical world and can act on other physical objects (hug, kiss, sit on a chair), there has to be a mechanism for that. My personal favorite is somehow the spiritual force gathers dust or carbon or water droplets or whatever and somehow forms a body that must be fed with energy of some sort to keep it together. If it doesn’t have a physical presence, then it can still sit in its idea of a chair. The chair doesn’t care. If there’s a scale on the chair, though, the chair is not going to register. But it won’t be able to interact with other physical beings. It’ll be able to kiss and it may even fool itself that it is kissing and feeling; but the other being is not going to necessarily feel it unless it is fooling itself as well. OK, maybe it’s not a quibble. I don’t remember Nick physically interacting with the world. I remember him magicking the bar down, but that wasn’t through his molecules, but his power affecting other molecules (however you did that). It really is an interesting problem, isn’t it? But I think if the being can interact with the physical world, it can have feelings; the feelings may not be the same as what carbon-based humans would feel, though. I think one factor to think about would be what hell-stuff is made of. Could be an imaginary substance (well, it would have to be, wouldn’t it? What I mean is not analogous to our Earth-stuff). I can imagine something like petrified wood. Maybe my Hadiz, slowly getting his fire-body replaced by carbon the longer he’s in the world, the stuff seeping through his system and replacing him molecule by molecule. (-: OK, that’s my story. But that’s one reason it’s so fun to read your blog. It makes me think Thoughts I Wouldn’t Have Thought Otherwise. Except Nick seems to get hungry, he eats (and eats more interesting food after Nita appears), and he seems to (? can’t remember) sleep – so maintaining his physical entity in this world requires some energy and fuel. Yeah. And perhaps he requires a greater ability to connect with humans the longer he tries — but fails — to solve the problem of the illegal demon pipeline. And there are consequences (lust? love?) and costs (leaving all this behind when he returns to the Afterlife) to being allowed (by God? or he takes it on himself?) to continue his mission. This ups the ante as he rushes (of course, there has to be a time constraint) to complete the job. He doesn’t sleep in the first draft until after he destroys the bar and meets Nita, then he falls asleep upstairs for the first time. But that was discovery draft stuff and I had no idea why. I still have no idea why a lot of what Nick does is possible. Because I’m still in discovery draft. I’ve been thinking about superheroes lately, too, because at this point, Nick is one because he has supernatural powers. And of course, super powers need Kryptonite (aka vulnerability). I’ve also been thinking about what happens to demons when they decide to stay in this world. They’ll assimilate, but what does that mean in this sense? And I’m thinking they become more human. I know they age here when they don’t in the Afterworld, or at least much, much more slowly. And that goes back to the relationship between the two worlds. I have much cogitating to do. I’m not paying too much attention (so I can read the resulting book without being totally spoiled) but could Nick not have a corporeal body in hell, but take on some sort of physical aspect on earth? (note I don’t say possess a body or have his old body) Then he could start out not really connected to that physical aspect (like the opposite of having phantom limbs) and gradually acquire the annoying ability to feel when he overstays on earth. But its been so long since hes had a body that he doesn’t really recognise this stuff or know what to do with it. That would allow for him to grow intellectually and emotionally and whatever we’re calling the body feelings thing. I’m trying to set this up logically (I know, I know). He’s dead. He died in 1492 (or something, I don’t remember). He’s in a tomb in Italy and he’s a skeleton now with a sword in his bony hands. His spirit went to the Afterworld and that’s where his father did the deal with the Devil to get him taken on as Office Manager. In order to do that, they’d have had to give him some kind of corporeal illusion because not even demons would be up for conversing with skeletons holding great big swords. So I need to extrapolate logically from that. Either Satan’s keeping the illusion in place, which would make sense during the whole employment period, or he got bored and just gave Nick the power to do it himself, which would also make sense. NO idea about the transfer of powers or what powers Devils have or any of that. Discovery Draft! Huh. I just had a thought. Nick would still have had a body when his father made the deal. Suppose Satan had the body brought to the Afterworld and just reanimated that. That would make more sense. The skeleton works better for my story. You don’t know how much I wish I had your insight into life, love and writing. I think I must be oblivious, or too self-absorbed or something. Now I’m going to ponder how this relates to my life and after that the current WIP. Must keep the priorities straight after all. Wow! I hadn’t stopped to think about Nick not being able to feel his emotions. Still I’ve known a lot of living guys with that problem. Ha ha. You’ll work this out, I have complete faith. Now, back to packing the crystal. I’m moving on the 11th. YAY! You’re finally moving! Congratulations! I am so glad for you. Our condo sold a month ago and it is such a relief when everything is wrapped up. It took five months, one bank refusing our tenants a loan (they did not like the condo lease-hold agreement), then our tenant/buyers not being too rapid on doing the next loan. Now you can move on with your life. This reminds me a little of Billy Zane talking about his character in Titanic, and how Cal is discovering that he has a heart at the very moment that it’s getting broken. This reminds me of a Kdrama called Best Love about a guy who undergoes surgery to get a completely artificial heart, and while he’s in surgery the doctor plays this pop tune about a heart beat. Fast forward ten years and he meets the former pop singer of that song and his artificial heart reacts to her. (BIG SPOILERS FROM HERE ON OUT). The thing I loved about this wacky story was how it started as a comedy and became a melodrama. The writer’s are famous for this style. About halfway, all the things that were totally goofy somehow become emotionally powerful. In this story, the idea that he was literally Cold-Hearted was so funny at first. He was over-the-top ridiculous and all about fame. All of his relationships were fake, and even his personality was really an imitation of the characters he played on stage in his acting career. He was so goofy that it crept up on me – the idea that he really had no heart of his own. The actor did a great job of adding these subtle mannerisms, like taking his hand and physically turning his head to make himself stop watching the heroine. He would walk after her, and then have to make his legs go the other way. His hand would caress her cheek, even when it was clear that he wished it wouldn’t. Once he met her, his heart (and therefore his body) had a “mind” of its own. And suddenly, the idea that the artificial heart was doing it’s own thing clicked all the parts of the story in place – like how the heart surgeries made him miss school, lack friends, and never learn how to develop real relationships. Or how growing up with the fear of dying made him so concerned for himself that it eclipsed his thoughts of anyone else. Or how being a sick kid who lived against incredible odds made him grow up with an inflated idea of his own importance. His heart changed that for him. It would race even though he logically felt nothing for the heroine. She was a fallen star and his career was meteoric. Logically they made no sense, but his heart said otherwise. It was such a clever way to take that cliche and root it in a logical physical reason. His heart and head were literally divided. So, his emotions were not at all connected to his heart, until they were. The show had him doing this goofy stuff (so goofy I almost couldn’t watch), as he tried to figure out why his heart reacted to her. However, as he spent time with her while trying to figure this craziness out, he began to merge the two – heart and head. (ANOTHER BIG SPOILER) And finally, as the two merged, he undergoes another heart surgery. His heart literally needs to hear her sing the goofy pop song to keep beating, and his emotional heart needs her to sing for him this love-song so that he can have a reason to keep living. And (as Dramabeans points out brilliantly) he’s the princess stuck in the tower that needs saving and she’s knight. It is a goofy and heard to watch beginning, but the shift that happens gets me every time I watch. And I’m surprised. It’s goofy and then it’s real. I never see it coming, but it’s been woven into the fabric of the story so well that makes sense when it happens. I know you’ll find your balance with Nick and Nita, keeping them off kilter until they click into place. I decided to stop reading at spoilers, because that sounds like my cup of tea! I love some magical realism, and I am a fan of melodrama. How cute! His heart beats when he sees the singer . . . .
LOL, kind of glad real life doesn’t work that way. I had a young doctor for the delivery of my second, and he wanted me to give birth to the stirring strains of Shaft. Now, I like funk and soul. But not during childbirth! I made him change it to kd lang. Both artists are entirely too old for my daughter, so I hope her heart stirs in other ways!
? Before you try this story, you might check out their best works – Master’s Sun and My Girlfriend is Gumiho. Master’s Sun is scary, but wonderful. It’s a new genre – Romantic Comedy/Horror. The main character sees ghosts, and touching the hero makes them disappear. I realized later that the lead is usually an action hero, but he was terrific in this as the self-absorbed businessman. My Girlfriend is Gumiho is about a mythical creature who wants to be human, and it’s so goofy funny and heart-tugging. The lead guy at first was so completely geeky that I thought I wouldn’t like it, but he is now one of my favorite leads ever. If you go with Best Love, just give it about three episodes for the strangeness of the hero to wear off. Around episode 6, things start to really start to fall into place and I think it is only 16 episodes, so it’s great for a marathon. I think it might be on Netflix, but I usually watch it at DramaFever or Viki. Sometimes they put things on YouTube, too. And it’s in Korean, but everybody has subtitles. And most Korean shows have two makes, so it’s callest Best Love or Greatest Love. Happy watching. Oops – Two “names” – not two makes. PS – I know I sound like an infomercial, but the concepts in this show do remind me of the Nick and Nita dilemma – and it’s great TV. One day maybe I’ll chime in with an American show comparison, but it’s just not what I’m watching. We endeavored to change things that affected the body and the soul in an effort to bring about changes in the spirit. I think we based it on the book, Ruby Slippers for the Soul which was about the line between soul and spirit. It could have come from the books of Dr. Caroline Leaf, a Christian neuroscientist who discusses the power of the mind. Anyway, just throwing that stuff out there in case any of it helps. This sounds like an interesting world-building point to explore whether or not God has feelings. Old Testament God has some hella intense feelings. Mostly jealousy. Does God have a body? For the other PoI comparison, do either of the AIs have feelings? The implication of “feelings in the body” is that we don’t have control over them to an extent. Crying, losing our breath, getting hot with anger, those are hormonal reactions to our brain-emotions. Even if an AI has a “body” in the sense of servers and chips and such, at best you have some overheating due to frantic/passionate thinking overworking the hardware. Otherwise, what is it that makes us believe in TM’s love for her assets, for all of the people she watched? Because everyone experiences and expresses feelings uniquely, the universal thing is actually emotion. Oh, that’s interesting, the Machine and its love for Finch, calling him Father. I think She loved Reese, too, calling him the Big Lug in Root’s voice, something She must have learned from Root. I think what made us believe that love, though, was the Machine’s actions. She didn’t have a body, but she had actions, she did things in the real world that demonstrated her feelings, so in that sense, she had a body in motion. I’m trying to avoid God in the book. I know, I’m a wimp. She’s female and omnipotent, but she’s also God which means she has galaxies to look at, so Earth and its Afterworld are pretty much two small towns of a huge country. As long as everything’s going well there, she can ignore them. OTOH, I’m pretty sure God’s the only one who can bring Nick back from the dead, which leads me to believe he’s going to stay dead. I’m still in discovery draft mode; it’ll come to me eventually. So if there isn’t a standard body to be in the grips of strong emotion (do the range of other supernatural beings on the island experience/express feelings the same as humans? ), then part of the story is either something restoring Nick’s ability to feel those strong emotions viscerally, which is also the traditional arc for someone like Nita, and/or either character becoming self-aware of the unconventional ways they’ve learned to express their “volume’s turned down low” emotions, usually via action. And the latter puts feelings back into the body, just by informing the audience of the new body language. Instead of ugly crying or being breathless, we’re to look for a clenching of the fist, or secretly tracking down an eloped couple and paying for the wedding to save the family’s social reputation. Again, still cogitating, but . . .
Demons are just another race and share a lot of traits with humans. Simpling this up as much as possible. I think there’s a feedback loop for Nita. That is, if Nita’s been repressing her emotions, then anything that triggers an emotional response is going to increase her need to repress which is going to strengthen that repression. Unless whatever is blasts straight through, and all those emotions she’s been repressing overwhelm her and she has to start over again, which is what happens. She takes so many hits in succession that she can’t handle it. One or two she could have dealt with, but the bam-bam-bam of impossible revelations that challenge everything she knows about who she is, where she lives, and what reality is just lay her out. It’s the old “destroy the village to save it” thing. Plus all of that happens with Nick and he sticks by her and that kickstarts the relationship which she is now vulnerable to because she’s reeling from everything else. What I was working with for Nick was sense memory, starting with food. He’s been dead for so long, he’s forgotten what it’s like to have senses. It’s why he can’t understand Daglas’s feeling for Daphne. He thinks Daphne’s a nice person, but he doesn’t get the emotional pull. What I’m missing is what gives him a body again. Whatever is it will start the loop: He tastes food and that makes him hungry which is a key to his body and that in turn makes him feel hot and cold and suddenly he needs a coat, etc. and somewhere down the line, he looks at Nita and thinks, “Oh. That’s why.” What I don’t know is how that happens. That is, I know that one sense leads to another, I don’t know how that gives him a body. At the moment I’m looking at a literal deus ex machina, but I’d like something better. If Hell is a bureaucracy, then the means should probably be bureaucratic: some kind of contract clause. Maybe it’s a reward for doing such a good management job, like a conditional signing bonus. Or, in the opposite direction, a punishment (of the “get a taste of and thirst for the forbidden before it’s whisked away again” variety) for staying away too long. The question is, of course, whether Nick getting back his body is meant to be a permanent thing, or if that’s just the way he’ll realize his feelings. That, or it’s the specific food Nick eats: maybe some Fruit of Life got smuggled out and landed in his dish. Really like the “reawakening/rekindling” angle of his senses. So many layers & meanings to play with there. I really, really want to read the dialog you’d write for the “deus” in the “machina.” Not that I get a vote, but still. My Latin is awful, but I think it would be “dea” in this case. So far she’s communicated by lightning strikes, which I see as the equivalent to swatting your toddler on the bottom when she throws a fit in the grocery line. Which Mollie still cites as one of the most humiliating moments of her life even though she was about four at the time. Bad parenting: it stays with you. Maybe if he wants to do something that requires a body, (such as taste food), he can conjure up parts of one. Gradually he needs more parts to do things…gradually the parts come together to make a body. Ooh then at the end he has to make a sacrifice, giving up the new body – essentially dying again. Sad but another death voids the contract and he is free. Old body is out of lease. Though, if you’re feeling the big skeleton with a sword thing, go with that. Better to go with what you connect with. Jenny, if Mollie never threw another temper tantrum in a public place, it wasn’t bad parenting. It may have been painful for both of you but I’ve seen a couple of 15 & 16 year olds throw temper tantrums in public in the last year – that’s bad parenting. There are some things that need to stop when you’re three. Like in Dogs and Godesses, the longer the gods stay in an earthly body the more human they become. Maybe you don’t need to explain that much how/where he gets his body. In dogs and Godesses we don’t really get a full explanation of where the odds of Kammani, or Sam where when they were in the underworld or “sleeping “. Again to reference City of Angels, when the Angel falls to earth, they get a body. No explanation of how, it just happens. Sometimes a lack of explanation is the best thing. If it feels right then overjustifying can kill it. Like Terry Pratchett said the pleasures of the flesh are pretty sparse without the flesh. Nick died, he went to work for the guy in charge of the underworld and then he became the guy in charge of the underworld. People absorb the environment they operate in. Life was just a memory without a body to feel it happening. And you lose memories, too. Really quickly, and Nick’s been dead for 500 years.